Jenne and Michael had their wedding reception at the Columns Banquets in Elma. They got married in July of 2017! The ceremony was at St. Joseph University in Buffalo and pictures were done at Knox Farm State Park. 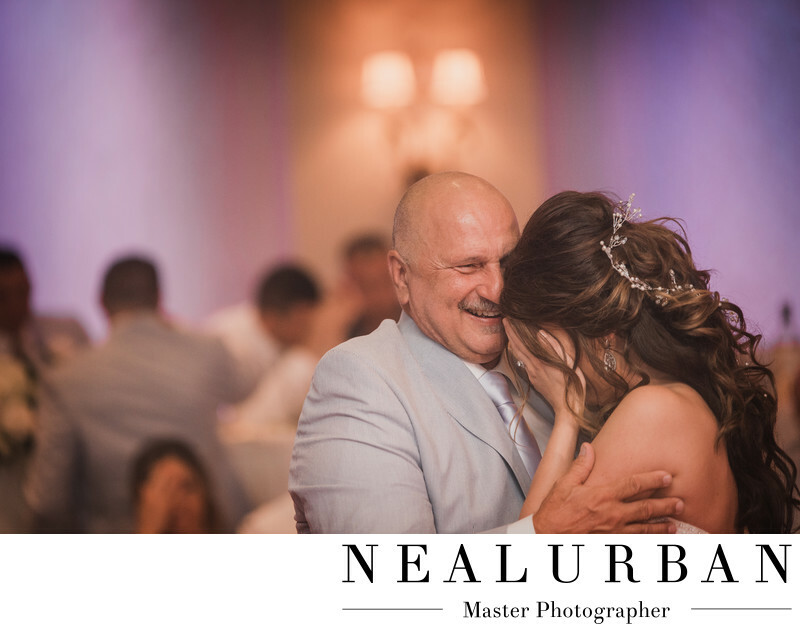 There are so many emotional moments during a wedding, especially during father-daughter/mother-son dances. The bride and groom can have such a hard time selecting the right song for this part of the night too. Jenne and her father had such an emotional song. The bride walked out hand and hand with her father and we could see from the look in her eye's this was going to be a tear jerker. She held it together for most of the song. The bride's father was smiling and laughing. He knew it was coming too! Then Jenne drops her head down and covers her face. Dad's reaction is priceless. There is so much joy on his face as he pulls his daughter in closer to him. For dances like these, Neal and I are always using different camera lenses from each other. If Neal is going for wide, more artistic images, I will have a 70-200mm lens on camera capturing the up close and personal images, just like you see here. We both always try to shoot images with nice boca lighting in the back ground. You can also see that here with the chandelier. The up lights also gave a nice touch of color. A mother/son dance can be just as emotional as the father daughter. A groom lets down his guard completely when he is dancing with his mother. Both the bride and groom seem to be in a world of their own when dancing with each other and their parents. There is so much feeling in images like these and we are always so happy to be able to capture these moments for them.